NVerzion is excited to offer the best in professional broadcast video servers and Time Delay systems. We have 30 years of experience in the broadcast industry, and we're bringing that to bear with our comprehensive and powerful video servers. Our products are built to fit easily in any broadcast television station, government station, public access, educational, house of worship or production house. These competitively priced servers offer HD/SD SDI I/Os with a powerful suite of built-in applications to manage ingest, playout, media management, and Quality Control. Automation agnostic, these servers integrate easily with your station's system. The NDelay Time Delay server is a powerful and easy-to-use solution for sports, news and live shows. Trusted around the world, this little server is the best time delay solution for any live event. 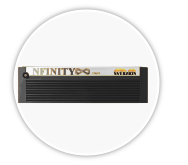 NFinity is the most flexible, reliable, and affordable solution for video playout and control available on the market today. NDelay is a new tool designed by NVerzion to optimize on-air programming delays, including censorship.